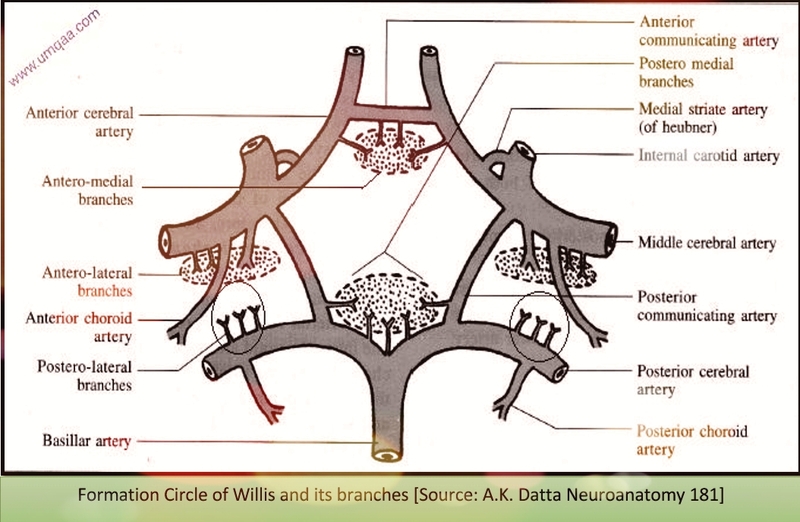 HomeneurologyWhat is the circle of Willis? 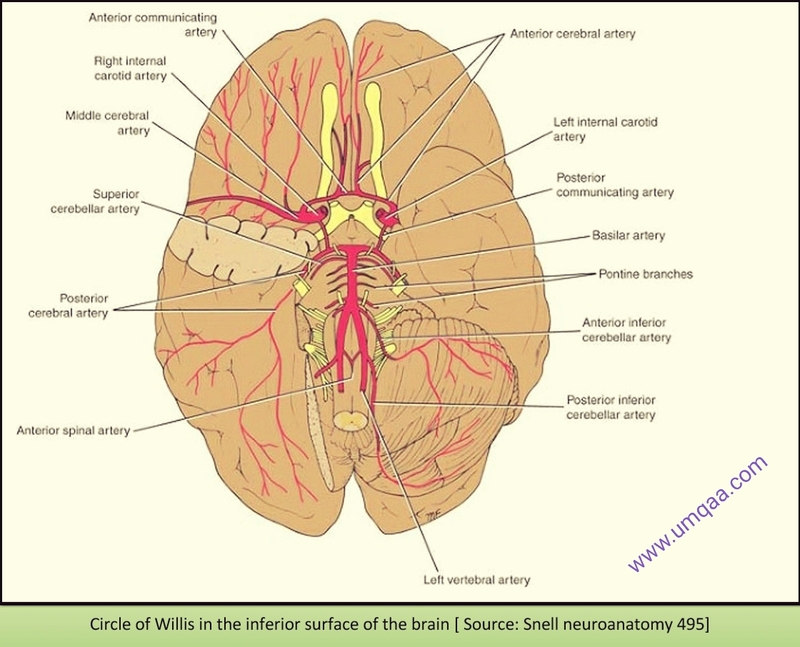 The arterial circle of Willis or The circulus arteriosus of Willis is a polygonal anastomotic arterial channel between two internal carotid arteries and two vertebral arteries. It acts a principal collateral channel to preserve the independent cerebral blood flow under normal condition or dependent blood flow in occlusion of one of the main artery. The arterial circle is situated in the interpeduncular fossa at the base of the brain surrounding the optic chiasma and other nearby structures. Posteriorly: By the proximal segments of both posterior cerebral arteries which are bifurcating terminal branches of the basilar artery. Arise from the anterior communicating artery and anterior cerebral arteries, pierce the anterior perforated substance and supply blood to the pre-optic and supra-optic regions of the anterior hypothalamus. Are derived from the medial striate (Heubner) branch of the anterior cerebral artery and lateral striate (Charcot’s) branches of the middle cerebral arteries. This group pierce the anterior perforated substance and supply the corpus striatum and most of the internal capsule. They are derived from the posterior communicating arteries and posterior cerebral arteries, pierce the posterior perforated substances and supply hypophysis cerebri, tubero-infundibular and mammillary regions of the hypothalamus, subthalamus, anterior and medial parts of the thalamus, and medial part of the midbrain tegmentum and crus cerebi. 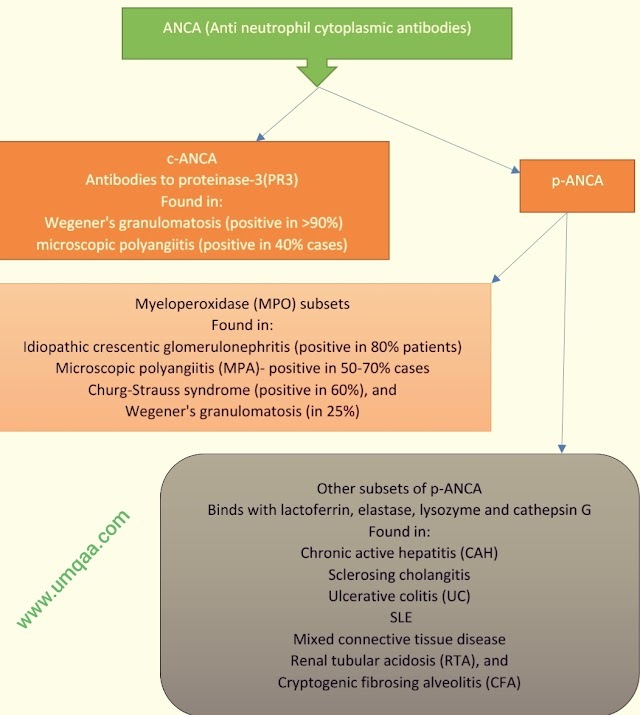 Are derived from the posterior cerebral arteries. They provide blood supply to the caudal part of the thalamus including pulvinar, geniculate bodies and lateral thalamic nuclei. 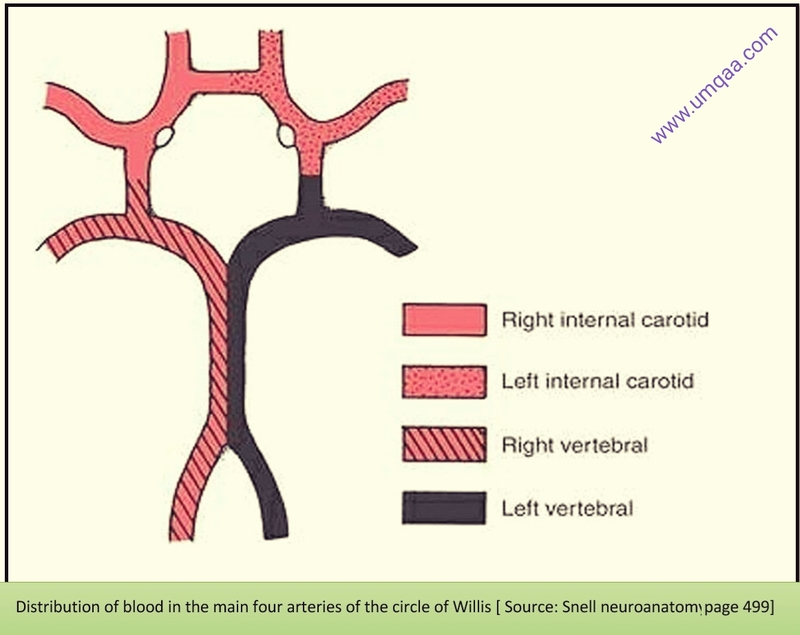 Although there are connections between the contributing arteries of the circle of Willis, under normal circumstances the blood from one main artery doesn't mix with the blood of another one. One side of the brain get blood supply from one internal carotid artery and one vertebral artery, and they are connected by the posterior communicating artery. But the pressure of blood in both main arteries are exactly the same at a point and blood doesn't mix unless there is occlusion in any one of them. Same scenario in between two internal carotids as they communicate via the anterior communicating artery. Surprisingly, the blood is not mixed even in the basilar artery where two streams of blood enters into from each vertebral artery! Each column of blood flow side by side without mixing up ( see image above).